Pawn endings do not arise out of nowhere. Before emerging as endgames with just kings and pawns, they pre-existed' in positions that still contained any number of pieces. Isn't it strange, then, that most chess endgame books make it look as if they came out of the blue? 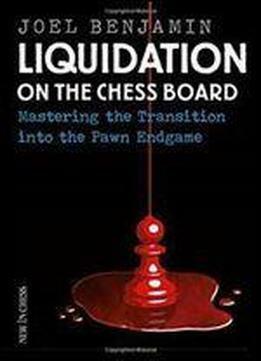 Liquidation is the purposeful transition into a pawn ending. It is a vital technique that is seldom taught. Strange, because knowing when and how to liquidate can help you win games or save draws. In this book, former US Chess Champion Joel Benjamin teaches you all you need to know about successfully liquidating into pawn endgames. He focuses on the practical aspects: what to aim for and how to get there. When to start trading pieces and how to recognize favorable and unfavorable liquidations. Liquidation is much more than just trading pieces. Enter a fascinating world of tempo games (triangulation, zugzwang and opposition), breakthrough, king activity, passed pawn dynamics, sacrifices and counter-sacrifices. Exercises will test your growing skills. Joel Benjamin does not just asks you for the winning or drawing continuation, he aims to make you think. A ground-breaking, entertaining and instructive guide.